The Rocket Robinson series of all-ages, graphic novel adventures follow the exploits of 12-year-old Rocket Robinson, his best friend Nuri, and their pet monkey Screech. This globe-trotting trio find danger, mystery and adventure wherever they go. The books are geared for school-age readers, but appropriate for all ages. Packed with action, danger, and plenty of fun, the books also make history come alive! 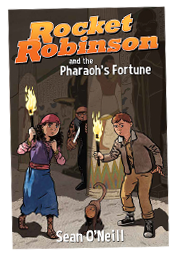 Book one, Rocket Robinson and the Pharaoh's Fortune, is set in the Egyptian capitol of Cairo in 1933. Rocket, along with his monkey sidekick, tries to unravel the mystery of a hidden, ancient treasure located somewhere in the ancient city. Along the way he befriends Nuri, who shows him the secrets of Cairo’s subterranean world. Before long they encounter master criminal Otto von Stürm, and his bloodthirsty henchmen, who will stop at nothing to find the treasure before our heroes. 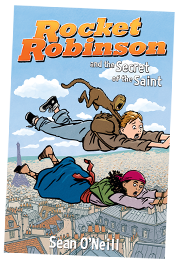 In book two, Rocket Robinson and the Secret of the Saint, Rocket, Nuri, and Screech are back, this time in Paris, a city filled with beauty, mystery, and danger. When Nuri’s uncle—a jazz musician named Turk—is framed for the theft of a mysterious painting from the middle ages, it’s up to our heroes to prove his innocence by tracking down the stolen artwork. But this is no ordinary painting. The secret contained within the painting—the secret of the saint—may lead to the most sought-after treasure in history!